City of York Council and the York, North Yorkshire and East Riding Local Enterprise Partnership have announced that today that they submitted a bid to government which could unlock over £100 million to help deliver York’s largest brownfield site. 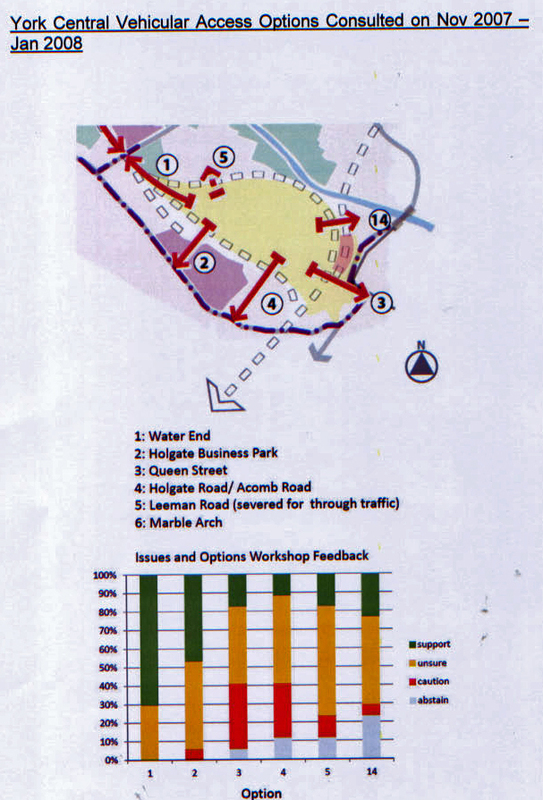 However, the bid doesn’t seem to have been approved by any of the York Councils decision making bodies. No copy of the bid has been published either on the Councils web site or on that of the LEP. It therefore remains unclear how much the York taxpayer might be expected to contribute towards the costs of the project. The last Labour Council courted unpopularity by allocating £11 million for the provision of a road bridge into the site from Poppleton Road. “If successful, York Central could be designated as an Enterprise Zone which will mean all of the business rates for the site, which would have gone back to government, will be retained in the area. This will provide the funding to be able invest in the infrastructure required to unlock the site and encourage business investment. Prospective businesses locating on York Central would also get full business rate relief for the first five-years, providing an incentive for inward investment and business growth. Estimates in the bid suggest this could help to create up to 6,600 jobs in the city, and over £1.1 billion value for the region’s economy. The jobs created would be high-value office based jobs, helping to grow York’s economy by an estimated 20 per cent and increase average wages in the city. Enterprise Zone status will also support the infrastructure for housing elements of the site, helping to create new homes on brownfield land and protect the greenbelt. York, North Yorkshire and East Riding LEP Board confirmed York Central as its top priority for Enterprise Zone status based on the strong proposition and the impact it would have for the region. It also submitted a bid for a ‘Coast and Country’ Enterprise Zone made up of a collection of sites in East Riding and Ryedale. The council is working with partners to produce plans for the development of the site, which will be subject to the usual planning processes including consultation with residents and businesses. It is expected that an announcement will be made by the government later this year, following full consideration of all bids as part of a competitive process”.